Butter. Flour. Cream. 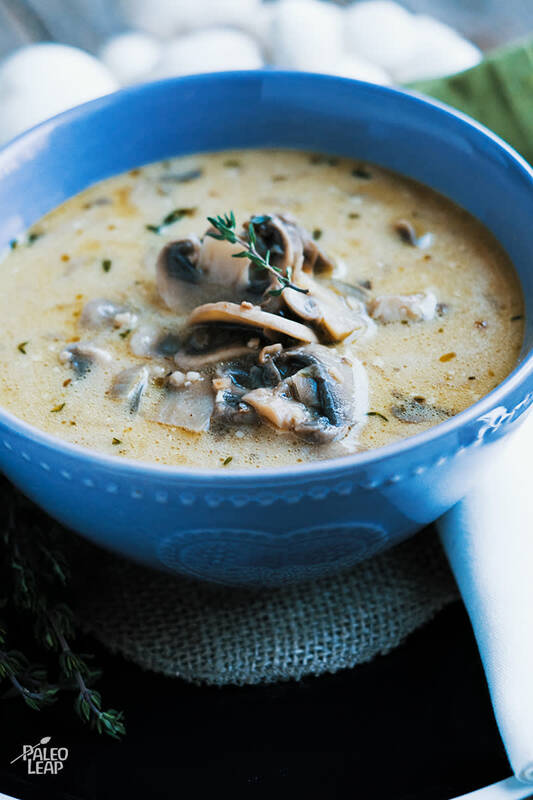 Sounds like just the right ingredients for a divine cake, yet these are the basics for a cream of mushroom soup… until we step up to the challenge and make it fit into our Paleo lives, after all, we are here to eat healthy and to stay fit. While ghee is still recommended for optimum flavor, those 2 tablespoons can easily be replaced by coconut oil (or duck fat) if you are avoiding dairy products altogether; as for the cream, full-fat coconut milk works wonders! And it is super easy to keep soups gluten-free simply by omitting the flour, or using tapioca starch as a thickener – if necessary. While cans of soup may save you some time in the cooking department, you will need to tread carefully if you are keen on watching what you eat. A typical canned cream of mushroom soup may contain corn/cottonseed/canola/soybean oil, wheat flour and monosodium glutamate among the mushrooms and dehydrated garlic. A little good tossed in the pot with the bad. Make your soup at home with fresh, wholesome ingredients and invite the pleasures of good taste and beneficial nutrients into your life, without worrying about the effects of BPAs. Paleo soups are so nourishing and easy to make, plus the list of amazing recipes are endless. Start with the new basic ingredients: vegetables, homemade chicken stock, fresh garlic and coconut milk – and mix and match from there. Melt ghee in large pot over medium heat. Add the onions, garlic and mushrooms; cook until onions are soft. Pour in the chicken or vegetable stock, add the paprika, nutmeg, and thyme leaves to the soup. Season to taste, cover and cook 15 to 20 minutes. Simmer, then pour in the coconut milk, remove from heat and give everything a good stir. If you want a thicker soup you can add 1 tablespoon at a time of tapioca starch mixed with equal parts of water until you reach a desired consistency.